Flagstone Pavers - Tile Tech Inc. There are several natural stones that can be used as paving solutions and flagstone is one of them. Flagstone pavers are flat slabs of paving stone material (natural), which is sourced from a quarry. Flagstone is usually made of slate, limestone, or sandstone as these natural stones can be easily cut and split into slabs. On the other hand, brick and concrete pavers are made at a paving plant. 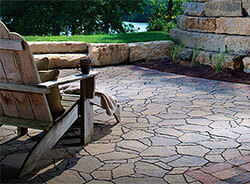 Flagstone pavers are best used in residential applications. Some of these applications include walkways, patios, stepping stones, and pool decks. They are not normally used commercially as these pavers are somewhat expensive and the laying out process is complex. These pavers are available in various shapes and colors. These hues range from browns, blues, and reds and combinations of these colors. These pavers are also irregularly shaped and are cut into square or rectangular pavers. The thickness of flagstone pavers is between 1 and 3 inches depending on their purpose. These pavers come with various advantages including versatility, high density, safety, durability, being low maintenance, easy installation, and aesthetic appeal. When it comes to versatility, flagstone pavers are resistant to acid and can be laid out directly on the top of the soil. These pavers can be used outdoors or indoors without using concrete or aggregate. Pavers from flagstone are also very dense and are considered low-absorption. This means that such pavers can withstand freeze-thaw conditions and they do not deteriorate rapidly under extreme weather. Safety is paramount when it comes to pavers. The flagstone paver is non-slip and is great for use in the swimming pool area. This paver is also resistant to heavy traffic, heat, and moisture. Flagstone pavers are not high-maintenance and are easy to install. Even do-it-yourself enthusiasts find this paver easy to work with. While the material is thin, it is also highly durable. Best of all, these pavers add a lot of aesthetic appeal to one’s home. They add charm and beauty to landscaping projects throughout the house. These pavers also come in various patterns and designs including herringbone, runner bond, basket weave, diamond run, interpace, and cobble-lock. This encourages a lot of creativity and brings out the inner artist in the homeowner. Because it involves a lot of creativity, architects and designers prefer these flagstone pavers for their design workability. These pavers can be arranged to highlight a certain theme to a particular landscape or outdoor area. The uses of these pavers are limitless.